Having lived in Gilmer County for nearly 40 years I consider it home. My husband John and I raised our 4 children here and now enjoy our reward – having 11 of our 15 grandchildren who live in the county. I am a naturalized citizen who has embraced everything America – the Constitution, our natural God-given Rights, the Rule of Law, and our Flag. I have had a full life; I studied Engineering, worked as a Health Care professional, studied Marketing & Business Administration, took time off to raise our children, and owned my own business. We are retired now giving us time to volunteer in our community, do some traveling, and do our best to help safeguard the future of our State and Country. First Baptist Church Ellijay has been our church home for 37 years. 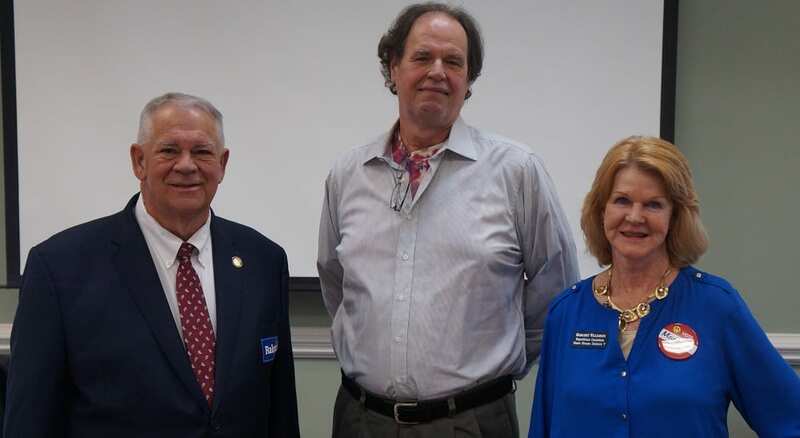 I am a member of the Gilmer Chamber of Commerce, Optimist Club, Gilmer County Republicans, Gilmer County Republican Women, and Georgia Federation of Republican Women. I’m also a Master Gardener Volunteer putting in many hours at the Ellijay Farmers Market, because how best to use the freedom than to make things beautiful. My Pro Life position is not one of political expedience like many politicians. I helped found a crisis pregnancy center in Ellijay which has served young women for over 25 years, was on the board, supported it financially, and was a counselor. On Sanctity of Life Sunday I was on the sidewalk praying and waving signs. It’s simple for me; you can’t have liberty without life. My first involvement in politics goes back to 1994 as a volunteer in a congressional race and since that time I have worked on several campaigns. Most recent was as county campaign manager for Donald Trump. As a regular visitor to the Georgia Capitol I keep informed on current legislation especially those that affect the taxpayers of our State House District 7. It has been distressing to see bills passed that fail to meet our needs but only help big business or special interest groups, bills that increase our taxes, and bills that burden us with unfunded mandates, regulations, and growing number of fees that hurt our economy. In retirement I have the luxury of being involved but the average North Georgian is busy with both spouses working, raising a family, taking care of elderly parents, or just trying to make time to spend time with their kids. – All with less money in their pocket. We should be able to trust that our Representative is watching out for us, and that is something that we are currently lacking. I will be your watchman. Under our current leadership, over the last 10 years, our annual state budget has grown from $15B to $26B. In 2015 the largest tax increase in the history of Georgia was passed under HB 170. That’s $1 billion more dollars that is taken out of the private sector every year. 52% of our 2017-18 budget goes to Education – that’s $13B and yet we rank #34 in the nation in education. College tuition has gone up over 75% while state contributions have decreased. Tuition for Technical Colleges has gone up 100%. Teacher pension plan (TRS) is severely in jeopardy with over $2B in unfunded liabilities and now a change in the pension plan is discouraging prospective teachers from entering into education – the result is less teachers and larger classroom size. How is this good for teachers and the kids?? Leadership tells us that Georgia is the #1 place to do business but professional assessments give Georgia a ranking of #17 in Economic Performance and #19 in Economic Outlook. Key factors contributing to this ranking; a State Income Tax that we should abolish, Property Tax Burden, and the recent legislative Tax changes – excise tax hike on fuel, and increased burden on counties that did not vote for T-SPLOST. In the 7th District almost 35% of our residents live at or below the poverty level, our annual household income is around $40,000, and our per capita salary in $11,000. All well below state and national averages. High property taxes, increasing school taxes, fees, penalties, regulations, fuel taxes, and the increase in sales tax on used cars that was just passed – all reduce spendable income. We need new leadership who isn’t out of touch with the everyday working men and women of Georgia, and really, who aren’t out of touch with reality. It seems that big government only sees us as a way to get more money so they can give handouts to their buddies. We pay more taxes for gas while politicians wan tto exempt Delta from paying sales tax on jet fuel! Who do you think needs the tax break? I’ve had enough of the good old boy system. We are already taxed and regulated more than enough. We live in one of the most beautiful parts of the US. Outdoor recreation attracts mountain bikers, hikers, boaters, fishing enthusiasts, and more. Other attractions include all the new locally owned wineries in their beautiful settings in all three counties in the District, cabin rentals, and most recentlyfabulous wedding venues. Local Chambers of Commerce work hard to bring in businesses with higher paying jobs and to attract tourists, as this industry is now the biggest contributor to our economy. We can all work together to make our counties attractive to tourists, business, and families – without compromising our Conservative North GA values. There’s no need to reinvent the wheel, limited government principles and a culture of hard work and what made the American economy great. Let’s just go back to that instead of subsidies and big government. Significant tax cuts, getting rid of penalties imposed by recent legislation, lowering the corporate income tax rate, and reducing the cost that each wage earner pays for benefits received by illegal immigrants, an annual cost to the state of $2.4B for education, health care, justice and law enforcement, public assistance, and government services. I also support a restructuring of the welfare system. Stronger requirements have worked in other States, why not here in Georgia. I will work with the many like-minded members of the House and Senate to make changes that reflect our principles of Conservatism. For years we have been promised “Conservative leadership”, “protection for our North Georgia values”, “Constitutional freedoms”, “protection for our Religious Freedom”, “support for our public schools and teachers”, “gun rights”, “good paying jobs”, a “crack down on illegal immigration”, a “stronger economy”, “fiscally conservative policies – less spending – lower taxes”, and the “end of state government benefits for those here illegally”. These are all promises taken right off the campaign mailers sent out by my big government opponent. What has he delivered on? Campaign promises are soon forgotten, our Constitution trampled on and despite overwhelming Republican control we still haven’t passed Constitutional Carry, meaningful tax reform, and the fight for Religious Freedom for all continues. Billions of dollars are paid in benefits to illegals, and government keeps growing despite the promise to “downsize government”. Out of control spending does not reflect “fiscally conservative principles” and the promise to “keep taxes low” turned into the biggest tax increase in the history of Georgia. As I visit around the district I am struck by all the needs and concerns expressed to me – teen suicides and deaths from opioid overdose, the injustice of finding criminals have more rights than the victim, a shortage of affordable nursing homes, and the frustration of dealing with mental illness. 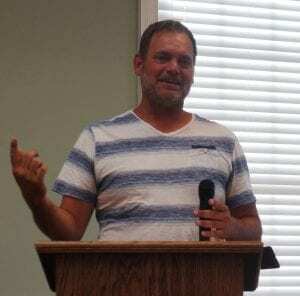 I have said from the very beginning of my campaign that I am not running AGAINST the establishment – I am running FOR the People of District 7, Fannin, Gilmer, and Dawson County. I will work diligently to meet their needs and not those of a minority of special interest groups. With our bloated budget and increased revenue thanks to a windfall as a result of President Trump’s federal tax cuts –surely we can do more to help the people of North Georgia instead of subsidizing Atlanta and their agenda. The Primary election is May 22nd, and you can start early voting April 30th. I ask you for your vote so that, together, we can restore principled Conservative leadership to Georgia. 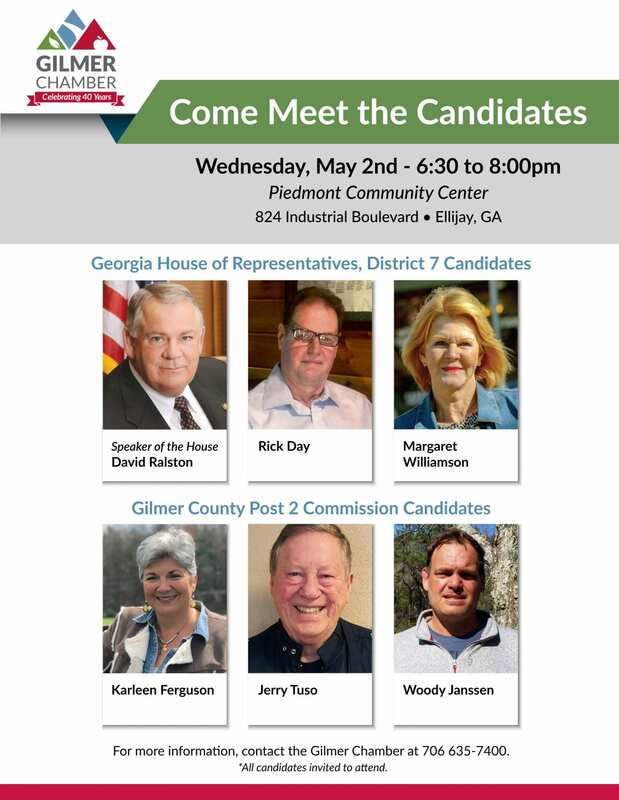 ELLIJAY, Ga. – As Qualifying Week begins in the state of Georgia, candidates have lined up to officially get their names on the ballot for the May General Primary to be held May 22, 2018, with a voter registration deadline of April 23. 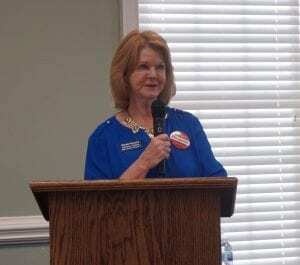 Williamson qualifies for May General Primary. One race in particular is being closely watched and it comes from Georgia’s 7th District. 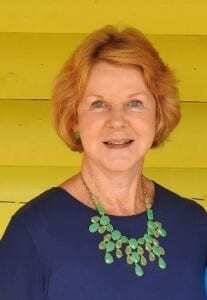 The seat currently held by Speaker of the Georgia House of Representatives David Ralston is being challenged by Ellijay resident Margaret Williamson. Williamson made her intentions clear when she announced earlier this year that she would be seeking the Republican nomination for the General Election to be held Nov. 6, 2018. Williamson acknowledged in a statement previously released to FetchYourNews that she had mailed the “Declaration to Accept Campaign Contributions” form to the Georgia State Transparency & Campaign Finance Committee. Having studied engineering, marketing and business, worked as a healthcare professional, and owned a small business, Williamson says that her involvement in politics spans over two decades when she worked on her first campaign in 1994. 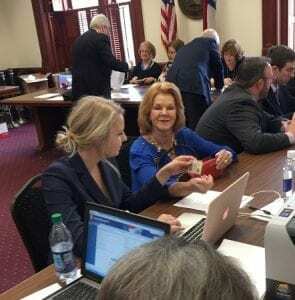 “As a regular visitor to the Georgia capitol, I keep informed on current legislation, especially those that affect the taxpayers of the Georgia State District 7,” Williamson said, explaining that since 1994 she has remained active and aware in politics. 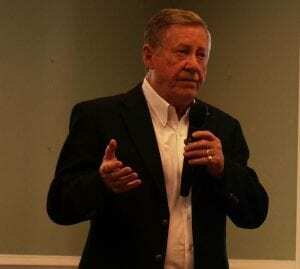 Williamson discussed the economy of our area, citing that while leadership in Georgia likes to dote Georgia as the number one place to do business, the statistics of this claim do not add up. 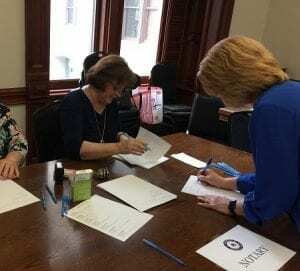 Williamson makes her candidacy official by qualifying on March 5. In Georgia State District 7, the average annual income per household is below that of the national and state averages, according to Williamson. She attributes this assessment to high property taxes, increasing school taxes, fees, penalties, regulations, and fuel taxes, which all decrease a family’s spendable income. 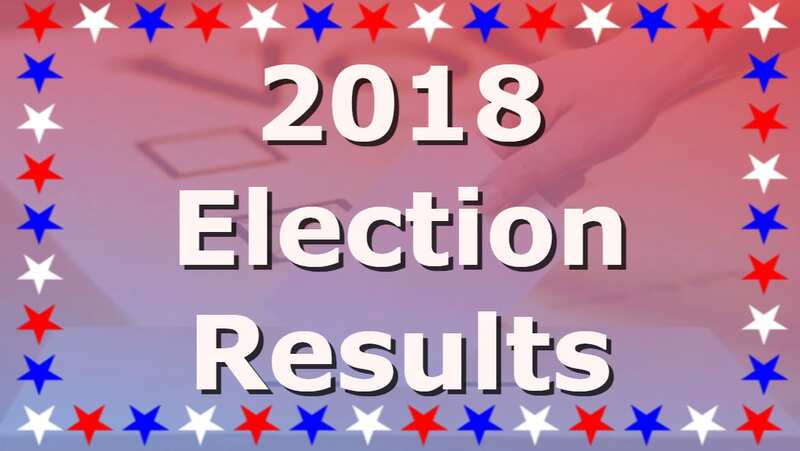 Upon completing the qualifying process yesterday, Williamson will continue campaigning in hopes of overcoming incumbent Ralston in the May General Primary. Margaret Williamson announces run for Georgia House of Representatives, District 7. 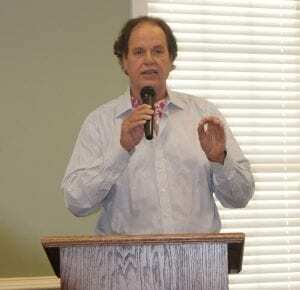 BLUE RIDGE, Ga. – The 2018 election is already starting to take shape as challengers emerge announcing bids for candidacy against well-known incumbents. 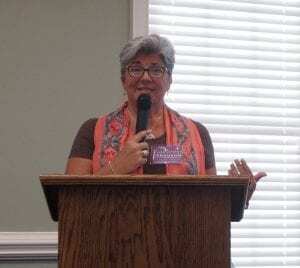 The most recent of these announcements comes from Margaret Williamson who intends to face off against Speaker of the Georgia House of Representatives David Ralston. 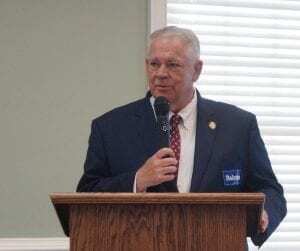 Ralston was first elected to the Georgia House of Representatives in 2002 and represents House District 7, which includes Fannin County, Gilmer County and a portion of Dawson County. Ralston is the 73rd Speaker of the Georgia House of Representatives, a position he has held since 2010. Already having begun the process of running for the House District 7 seat in the Georgia House of Representatives, Williamson acknowledged in her statement that she has mailed the “Declaration to Accept Campaign Contributions” form to the Georgia State Transparency & Campaign Finance Committee. After approval of this form, Williamson’s next step will be to complete the qualifying process held in March of this year. The qualifying will officially make Williamson a candidate in the Republican Primary for Georgia State House Representative, District 7. Williamson concluded her statement by announcing that she is in the process of creating a Facebook page which will contain her position on various issues. A General Primary Election for both Republicans and Democrats will take place on May 22, 2018. Voter registration deadline for the Primary Election is April 23. Winners of the primaries will face off in the General Election to held on Nov. 6, 2018.